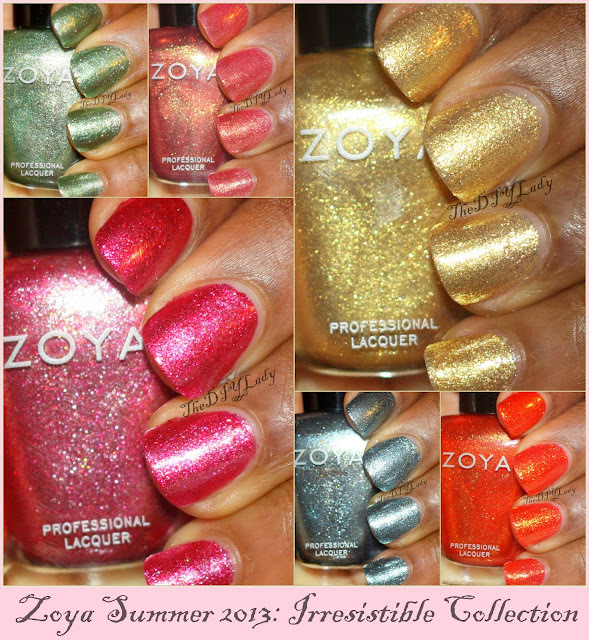 Today I have swatches of Zoya Summer 2013 - the Irresistible Collection!! This collection is full of Foil Metallic Polishes in bright summery colors! And Please click read more below because this post is picture heavy. First up is Zoya - Rikki. A green Foil Metallic goodness. It has some shimmer in it and application was lovely. I thought this was red at some point, but it's actually orange, and makes me tasty for tangerine! Anyone ever had those? Taste soo good! Look at all that gold sparkling! I took a thousand pictures of Amy!!! See, I'm not lying. Zoya - Amy was an instant favorite of mine in this collection. The Orange just screams - summer, fun, fruits, fruit juice and all things happy - to me. She'd make for a great Pedicure polish too. Next up is Zoya - Kerry. No, it's not a dupe of Ziv. I promise you this. It is a lot more brighter than Ziv and has a shine my camera seem to dull down to what you see here. Kerry has sort of glass speckles in it, and it is just so RICH! I can see myself reaching to this one on those summer days when I don't have a long time to do a complicated mani. This kind of color makes a statement without nail art or anything else done to it. Soft pink metallic foil polish. I see Gold, I see coral in this one. Zoya describes Tinsley as a "Rose Gold Metallic Foil", and I agree with them. It's very pretty in person and shimmers with each turn of the hand. This one screamed FOIL the most in this collection!The finish is metallic and the shine is unbelievable! It's like a mirror! It was reflecting on everything and my camera kind of freaked on capturing its true beauty. I Love the shimmer in it and was glad my camera at least captured that. This shine reminded me of FeiFei, but they are two different polishes (might do a comparison post later). Please make some noise for Zoya - Bobbi. *sighs*... Certainly Irresistible!! Bobbi is Beee--yooouuu---ti---full!!! Hot Hot Pink!! Just the way I like my summer polishes! 2 coats of pure perfection. Zoya Continues to WOW me with their amazing formula! All of these were 2 coats without an additional use of topcoat. Top coat should give you a more glossy feel, but the shine on all of these are already perfect. I'm sure you know my favorites from just reading this post, but I'll mention them again. The rest of the polishes not on my fave list will of course still be getting some love from me. Are you guys excited about this Summer collection from Zoya? Stay tuned on the blog because I have swatches of the other Summer 2013 - Pixie Dusts and Stunning Collections coming up soon! This collection is so gorgeous! I really love this collection a lot!